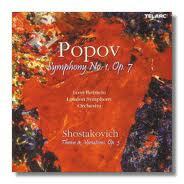 This album was nominated for the 2006 Grammy Award for "Best Orchestral Performance." “Botstein and the LSO deliver a powerful reading of Popov’s complex and densely turbulent work. The clarity and articulation of inner parts is little short of remarkable at times, especially in the first movement. Tempos are often uncompromising, as in the final movement, where the manic marking of prestissimo is obeyed despite a horn bobble two-thirds of the way through. I’m not surprised that Botstein was satisfied with the results, since it has more than enough character and control to compensate. The Shostakovich must have seemed like a walk in the proverbial park after the Popov, but the LSO applies all the warmth and Russian Nationalist sheen at its command. The results are a delight.